Season passes give you access to unique terrain at the most iconic winter destinations in North America, valid for the entire 19/20 winter season! The Ikon Pass is your opportunity to access unique terrain at over 30 of the most iconic winter destinations in North America, join a like-minded community, and seek out new adventures as you explore all that the mountains have to offer. Ikon Pass holders will enjoy access to Aspen Snowmass, Steamboat, Winter Park Resort, Copper Mountain and Eldora in Colorado; Squaw Valley/Alpine Meadows, Mammoth Mountain, June Mountain and Big Bear Mountain Resort in California; Jackson Hole Mountain Resort in Wyoming; Big Sky in Montana; Stratton, Killington and Sugarbush Resort in Vermont; Snowshoe in West Virginia; Taos Ski Valley in New Mexico; Tremblant in Quebec and Blue Mountain in Ontario, Canada; SkiBig3 in Alberta, Canada; Revelstoke Mountain Resort and Cypress Mountain in British Columbia, Canada; Sunday River and Sugarloaf in Maine; Loon Mountain in New Hampshire; Deer Valley Resort, Solitude Mountain Resort, Brighton Resort and Alta Snowbird in Utah; Crystal Mountain and The Summit at Snoqualmie in Washington; Boyne Highlands and Boyne Mountain in Michigan; Niseko United in Japan; Valle Nevado in Chile; Thredbo in Australia, and Coronet Peak, The Remarkable and Mt Hutt in New Zealand. Special offers are also available at CMH Heli-Skiing & Summer Adventures. 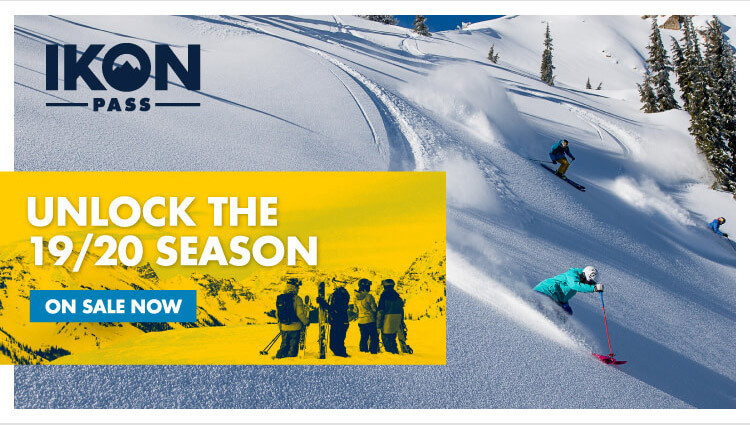 Unlimited Access at Copper Mountain, Eldora Mountain Resort, Steamboat, Winter Park, Squaw Valley/Alpine Meadows, Big Bear, June Mountain, Mammoth Mountain, Tremblant, Blue Mountain, Solitude Mountain Resort, Crystal Mountain, Stratton, and Snowshoe. 7 days at Big Sky, Deer Valley, Jackson Hole Mountain Resort, Revelstoke Mountain Resort, Cypress Mountain, Sugarbush Resort, Sunday River, Sugarloaf, Loon Mountain, Taos Ski Valley, Brighton, The Summit at Snoqualmie, Boyne Highlands, Boyne Mountain, Niseko United, Valle Nevado and Thredbo. 7 total days at Alta/Snowbird, Aspen Snowmass, SkiBig3, and Killington - Pico, Coronet Peak, The Remarkable, Mt Hutt. ** 10 blackout dates (Dec. 26-31, 2019, Jan. 18-19, 2020, Feb. 15-16, 2020) apply to all resorts with 5 day access and to unlimited access at Squaw Valley/Alpine Meadows, Mammoth Mountain, June Mountain, Solitude Mountain Resort. Blackout dates on July 4-19, 2020 apply to Thredbo.